The level of competition farthest away from the Major Leagues – in both distance and experience – is the Dominican Summer League. The St. Louis Cardinals’ club there opened 2017 – its 13th season in the rookie-level league -with promise, coming off their best season ever, 45-26 (.634) in 2016. This optimism was furthered by the parent organization spending lavishly on international free agents, several of whom were activated in 2017. Yet, the team’s overall results were disappointing. The Cardinals finished 30-40 (.429), in sixth place in the eight-team South Division. They won exactly 10 games in each of the three months – June, July and August – with a losing record in each and finished 18.5 games behind the division-leading Twins. The Dodgers2 team, champions of the North Division, beat the Dodgers1 club in the league finals. With so many inexperienced players, won-loss records are de-emphasized as youngsters are tried defensively at different positions and in different situations. To ease travel, each team played exclusively within its division. Series were always of two-game duration – one at home and one away. That meant three series per week with Sundays off. In addition to the Cardinals and Twins, other division opponents were the Mets1, Rockies, Angels, Phillies Red, Yankees and Nationals. As noted above, it was a consistent but uneventful season for the Cardinals, with a losing record in all three months of play and losing marks both at home and on the road. After a 4-1 start, the Cards dropped four in a row, the last time they would touch .500 for the season. In two of the four losses, the pitching yielded double-digit runs, a signal of difficulties to come. June ended with a 10-13 record. July began with a season-worst five-game losing skid on the way to a 10-16 month. The last three games of July and the first of August marked the season-best four-game winning streak. During the final month, manager Fray Peniche, in his seventh year, and his staff got the team playing a bit better, going 10-12, but they were eliminated from the division race fairly early in the month. The 2016 season’s DSL Cardinals best-ever .634 winning percentage appears to be an anomaly, as 2017 is the organization’s fourth losing season in the last five. The .429 mark is the fifth-lowest winning percentage in St. Louis’ 13 years in the league. Though division configurations have changed over time, the sixth place finish is their second-worst since 2005, after a ninth place finish by the 2014 Cardinals. 2017 erased most of two straight years of double-digit win improvement by the Cardinals, since the 2014 low point. Here are the DSL Cardinals records by year. They are still looking for their first division title. Prior to 2016, the DSL Cardinals had relied in large part on pitching. 2017 marks a major downturn in mound effectiveness, with the offense taking a more prominent role. Cardinals pitching was almost an entire run per nine innings worse in 2017 compared to 2016. The growth was from 3.53 to 4.50. In fact, it is a major change from 2015 and 2014, which were also right around the 2016 mark of 3.53. The 2017 Cardinals team ERA of 4.50 is 37th of 40 DSL teams and is substantially higher than the DSL league average of 3.63. In terms of baserunners allowed, with walks plus hits per innings pitched, WHIP, used as a surrogate, the Cardinals’ mark of 1.51 was 38th, third from the bottom. The young staff averaged 18.1 years of age, almost the same as the year before and a half-year younger than the league average of 18.7. Tutored by veteran pitching coach Bill Villanueva, back with the DSL club in 2017, the Cardinals pitchers dropped from #1 in strikeouts last year to the bottom third in 2017, at 28th, with 485. The Cardinals were right in the middle in terms of free passes issued, logging the 19th most in 2017. Again, it was another annual decline, after the staff walked the ninth fewest batters in 2016. In terms of age, the Cardinals hitters’ average age of 17.5 ties them for fourth-youngest roster in the league and more than a half-year younger on average than the league mark of 18.1 years of age. Under long-time assistant hitting coach John Matos, who took over as the regular hitting coach this season, the Cardinals offense had a good showing, but again, the results were down from 2016. The 2016 Cardinals were tops in the DSL in runs scored with 438, but fell to 13th with 349 in 2017. That is a drop of 89 runs year to year, or over one and quarter runs per game on average. With team ERA up by almost a run and scoring down by over a run per game, it should be no surprise the team win total took a nosedive in 2017. The Cardinals continue to be a good hitting team despite the run scoring decline. Specifically, the team was sixth in batting average at .255, but still down from their third-place showing at .265 last year. The league average was just .241 this year. The Cards were fourth in the league with 113 doubles, after leading the DSL the year before. In home runs, they fell from the league-leading 35 last year to 25 in 2017, still sixth-most in the DSL. As a group, the hitters lost considerable patience from year to year. The 2016 Cards took the third-most walks at 347, with that falling to a tie for 25th at 247 – exactly 100 less in 70 games. That translates into a drop in OBP, where they were second at .363 last year to .344 in 2017, but still good for sixth. When they did reach base, the Cards were not standouts. They stole just 46 bases, with was third from fewest in the league after being last in each of the prior two seasons. When they did try, they were bad at it with a success rate of just 53.5 percent, down over 20 points from the year before. In three-base hits, the power in the bats overcame the apparent lack of speed with the team’s total of 27 three-baggers ranking in a tie for 14th in the circuit. That was down from 35 and fourth, respectively, the year before. Putting it all together, in OPS, the Cardinals were a solid sixth at .706 after leading the DSL at .756 in 2016. The Cardinals were firmly in the bottom quarter in fielding percentage with a .950 mark ranking them 33rd, down from .959 and 19th one year ago. 144 stolen bases were attempted against Cardinals batteries in 2017. 58 were nabbed stealing, for a 40 percent success ratio that was tied for 13th-best and above the league average of 36%. For the second consecutive year, two Cardinals were named DSL All-Stars. Not surprisingly, both are offensive performers – Ivan Herrera and Pablo Gomez. Catcher Herrera, a 17-year old from Panama, put together a strong first-year campaign with a slash line of .335/.425/.441/.866. In three of the four categories, the right-handed hitter topped the team and was second in the other, slugging. He was one off the team RBI lead. Herrera threw out 40 percent of attempting-to-steal baserunners at 34 of 85. At 18, Gomez, who was also in his first professional season, batted .300 with a .337 OBP and .368 slugging percentage. The second/third baseman posted a solid .705 OPS and tied for the team lead with eight stolen bases. The Cardinals have signed at least 12 youngsters after the July 2nd signing period, with 10 of them inking 2018 contracts. The two who played in the 2017 DSL are pitcher Jesus Cruz and third baseman Francisco Hernandez. The right-handed Cruz, at age 22 a veteran of his homeland Mexican League, moved to the GCL for one game, then to State College this summer. 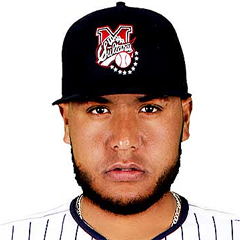 In the DSL, he appeared in nine games with and posted a 0.71 ERA with 19 strikeouts against four walks. Hernandez, 17, did not provide much with the bat in his debut, with a slash line of .200/.253/.311/.564. Only four of his hits went for extra bases, including three home runs and 10 RBI. Hernandez struck out in 28 percent of his plate appearances, took just three walks and stole just one base in four tries. The group of 12 signees includes six Dominicans, four Venezuelans, a Mexican and a native of Canada. In addition, the bulk of the 2016-2017 international class suited up for their first official action this summer – close to two dozen new recruits. They included outfielder Victor Garcia ($1.5 MM), outfielders Carlos Soler, Luis Montano and Alexander Samuel, infielder Franklin Soto and pitcher Roy Garcia, with the latter group all having received six-digit signing bonuses. 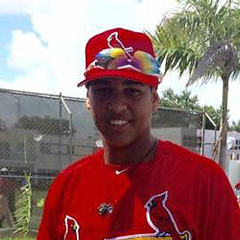 The 2017 DSL Cardinals should compete in the Dominican version of instructs, which usually commences at the Cardinals academy in October. Joining them will be the remainder of the 2017-18 international signees who have yet to appear in regular-season DSL games. The offense-slanted DSL Cardinals will hopefully build on their 2017 experience and progress to an even better 2018 performance, along with graduating a number of standouts to play in the States. Link to master article with all 2017 award winners, team recaps and article schedules for the remainder of this series. Of course, that will include our selections as the DSL Cardinals Reliever, Starting Pitcher and Player of the Year.